I love granola but it is usually filled with fat. 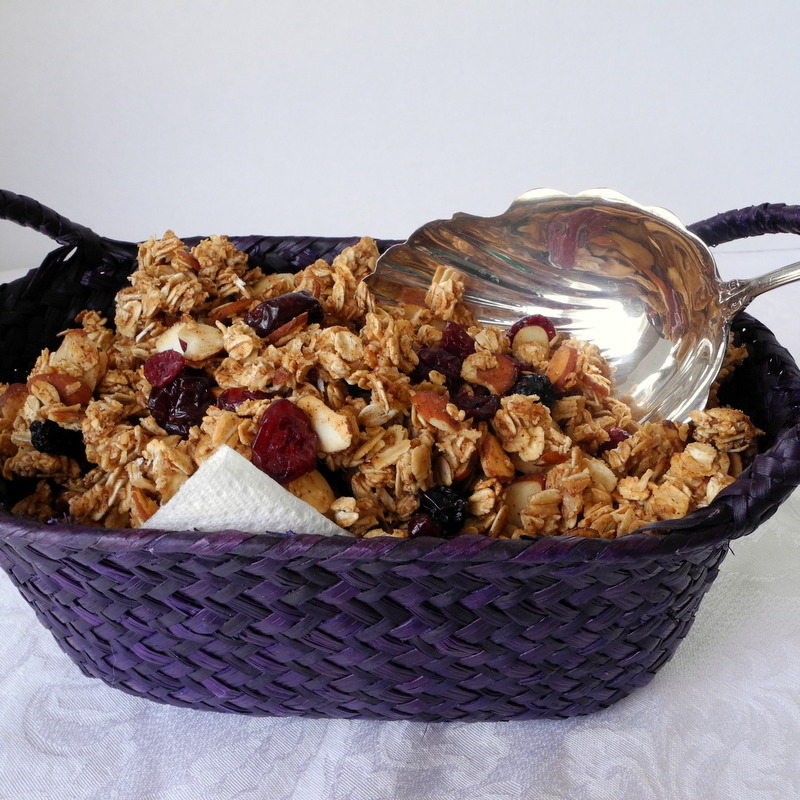 This granola doesn't have any fat other than what is naturally found in the nuts and oat and a little cooking spray to keep it from sticking. Next time, I'm going to try it without the cooking spray because it didn't stick at all, and I have a feeling that it won't even without the spray. It is great for breakfast or for a snack. And, best of all it is better than store bought and much better for you. And, it probably takes less time to make than it would to go buy it. If you are really wanting to cut calories and not just fat, you can also reduce the amounts of nuts and dried fruit since both are very calorie dense. 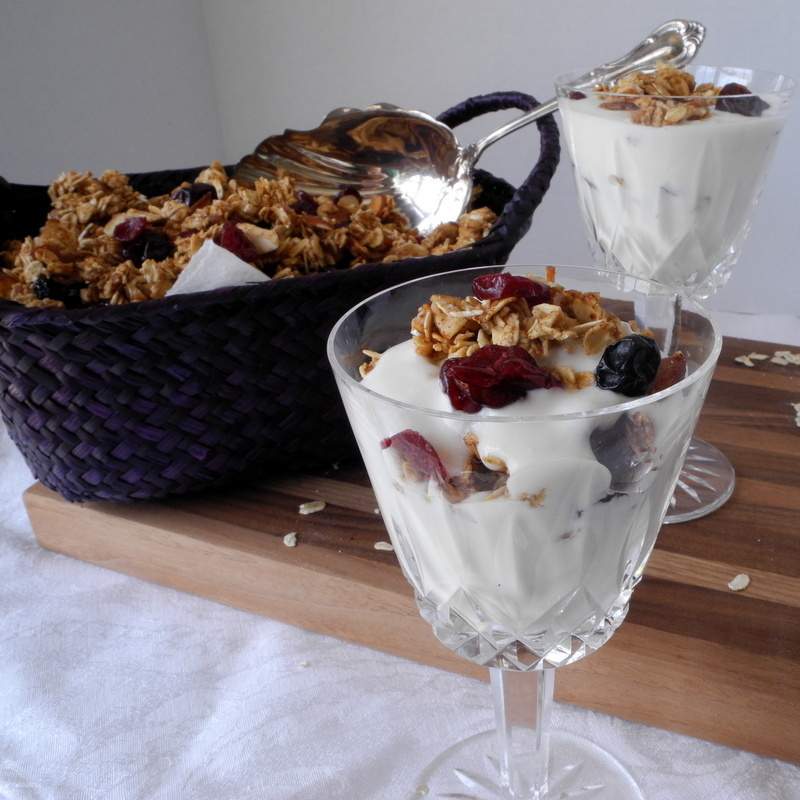 I show it here for breakfast in a yogurt parfait made with homemade yogurt. This perfect timing as Yummy Inspirations has just started hosting Breakfast Ideas Mondays. This is going to have to go on Sunday night, but I hope you will enjoy it Monday morning with all the other posts there this week. Preheat oven to 350 degrees. Line a large cookie sheet with parchment and spray the parchment lightly with cooking spray to prevent the granola from sticking. Combine oats and almonds in a medium bowl. Stir to evenly distribute. Combine cinnamon, nutmeg, and brown sugar in a small bowl. Blend with a fork until evenly distributed. Beat egg whites and vanilla in the large bowl of an electric mixer until foamy. Fold the oat mixture into the egg whites until well combined. Fold the brown sugar mixture into oat-egg white mixture until well combined. Finally, fold in the honey. When all ingredients are evenly distributed, spread evenly into the prepared pan. Bake for 25 minutes, stirring a few times as it bakes. Remove from the oven and allow to cool before stirring in fruit. Thank you for linking up at the 1st Breakfast Ideas Mondays Link Party! Your breakfast creation looks indulgent and something I MUST try! You are very welcome. I think it is a great idea. 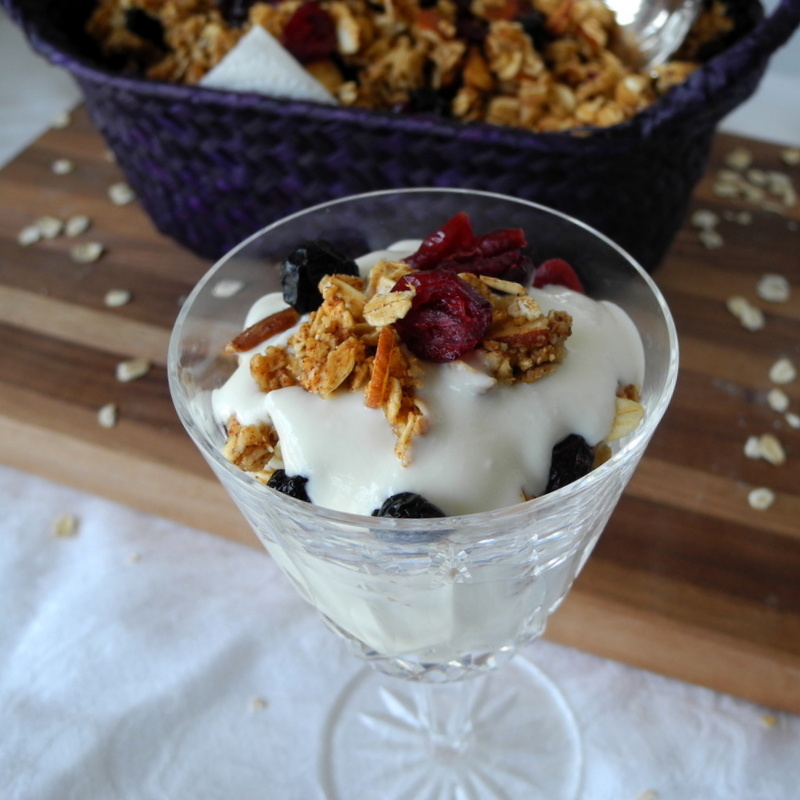 As for the granola, I can't stay out of it for breakfast or any other time. 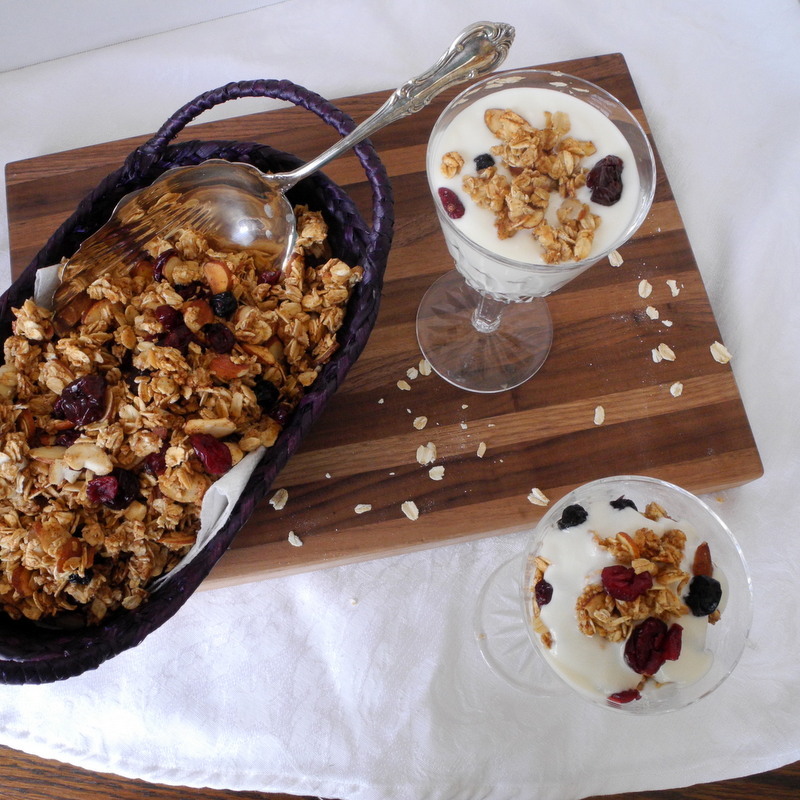 oh yum, i love homemade granola! looks awesome! This granola looks absolutely lovely.